It’s nearly that time again – time to crack open those chocolate eggs, toast your hot cross buns and wish you had a little chick or bunny to cuddle with! I’ve been painting Easter nails for years (check out my 5 minute Easter manicure for beginners HERE!) – what better excuse is there for whipping out all your pastel shades at once?! But I’ve never done a chocolate themed set before so that’s what we’re going to try this time….here we go! First Finger: Barry M On Your Marks, Barry M Huckleberry Blue, Barry M Rose Hip and Barry M Sugared Apple – applied using striping tape – remember to take you’re tape off before the polish dries to get clean lines! Middle Finger: Barry M Gold Foil, Barry M Coconut and Barry M Silk Paint Pink – Using a nail art brush draw a dot in the middle of your nail and two sideways triangles at the side to make a bow. Steadily paint a vertical line up through the middle of your bow and highlight with the white polish. 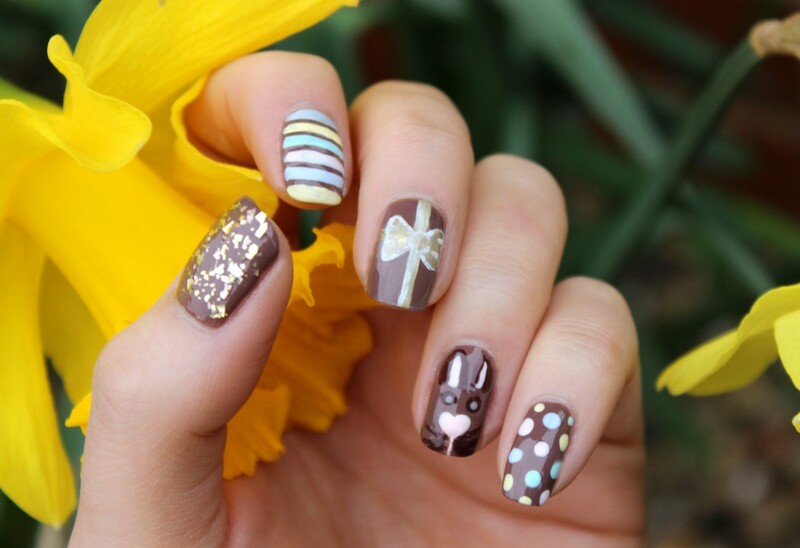 Ring Finger: Barry M Rose Hip & Barry M Chocolate – Using a small nail art brush and a dotting tool paint a nose, eyes, whiskers and ears to create an adorable bunny face! I made the nose into the shape of a heart using a dotting tool to connect three little dots for extra cuteness! Little Finger: Barr M On Your Marks, Barry M Huckleberry Blue, Barry M Rose Hip and Barry M Sugared Apple – applied using a dotting tool – remember to keep them evenly spaced. Start by dotting a line down the centre and then filling in either side! Finish with a generous coat of Seche Vite and you’re good to go! What are you wearing on your nails this Easter?